Aren't a Paper Pumpkin subscriber? Why not? If you haven't tried these kits before, now is the time to start! Right now, Stampin' Up! is offering a very special deal--Buy one month and get the second month free! That's right, you get two for the price of one! Order now and you will get the September kit and then the October kit will be free! If you decide you don't like it, you can always cancel after the October kit (don't cancel before then!) but I hope you'll decide to keep receiving this monthly surprise in a box! Most are card kits, although there are usually 3-4 a year that are not. Even if it is not a card kit, you can take the elements of the kit and make cards with them! I usually make a few of the cards like the directions show and then make alternative projects. Remember, the value in the kits is the stamp set! These are exclusive to Paper Pumpkin and of course can be used over and over again. The kits come with stamps, ink, paper products, embellishments, glue dots or dimensionals--really just about all you need to put these kits together! You'll need scissors and perhaps some tape. You even get a clear block in your first kit! And as a subscriber, you can also purchase past kits, if available! 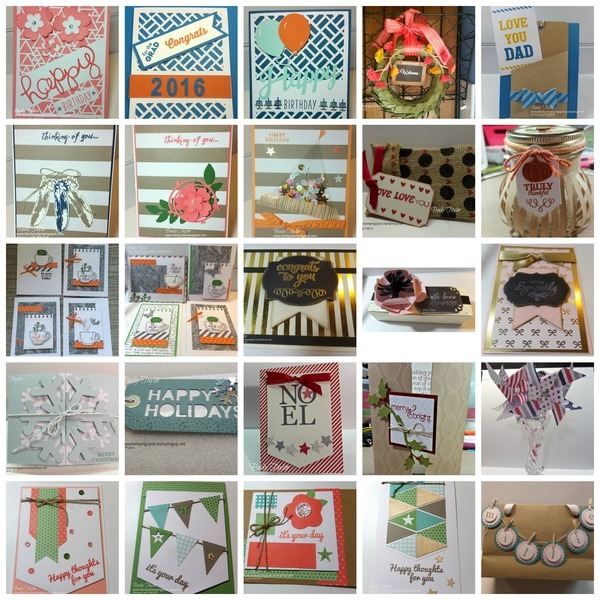 You can also put Stampin' Up! Paper Pumpkin in your search box on pinterest and find all sorts of alternative projects made by many people. I am so in awe of the creativity of everyone making these items and I'm so happy to have these groups to further inspire me! The 10th of the month is the cut-off to receive the September kit, so if you want to get that kit, subscribe now! Just click on the Monthly kit button above and get your Paper Pumpkin subscription going! TO GET THIS BOGO DEAL, BE SURE AND USE THE CODE "BOGO" IN THE PROMOTION CODE BOX! 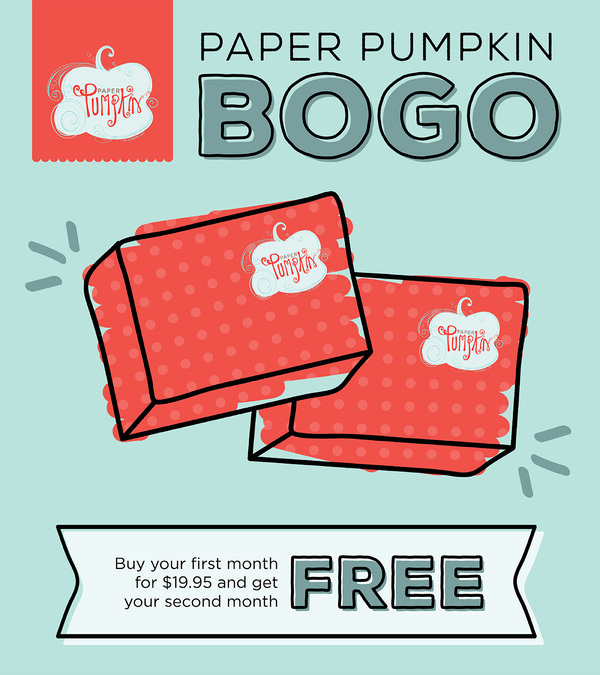 I hope that you'll take advantage of this great deal and try out Paper Pumpkin! You do have to be a first-time subscriber to take advantage of this offer.